With 150 offices in 13 states, Comfort Dental Group is the largest and only true dental franchise in the United States. Despite the company’s vast footprint, each location exudes a neighborhood feel, with a strong connection to the local community. To support this hyper-local approach, Comfort Dental installed displays in each of its waiting rooms to highlight the academic, athletic and extracurricular achievements of local high school students. This “Screen of Fame” has become a great vehicle to promote local accomplishment and create a sense of pride within the local community. 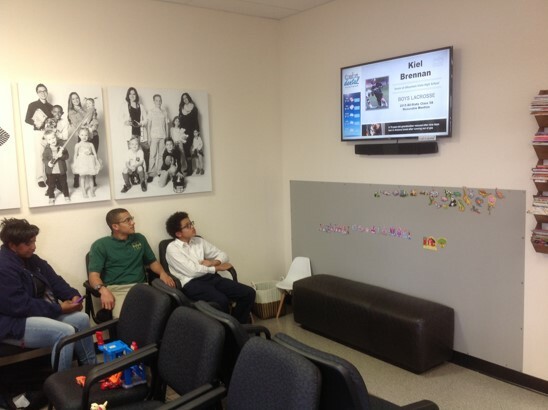 Comfort Dental has since diversified the content displayed on the waiting room screens to better connect with patients as they await their appointments. Each screen is attached to a BrightSign HD222 digital signage media player, and the entire network is managed remotely via BrightSign Network. All locations receive universal content such as updates from the American Dental Association or special marketing campaigns that span Comfort Dental in its entirety. But what sets the installation apart is how effectively it can be used at the local level. For example, Comfort Dental’s orthodontics offices can cross-promote their specialty services in nearby general dentistry offices. Local video content also features sporting and other community events, as well as local news and weather information. All told, the number of Comfort Dental locations connected to this digital signage network is quickly approaching 150, with further plans for expansion already underway. The signage has been so well received by the franchisees and by the patients, that new offices are automatically outfitted with a display and immediately connected to the network.